Okay, I still like bread, even though it’s gluten free. And, bread isn’t exactly ‘allowed’ on the Fuhrman diet, but it does allow a starch serving a day, so today I really wanted bread. And, if I’m going to eat bread, I may as well make it semi-healthy bread. This is not a vegan bread. I’m still working on a gluten free bread that will still taste like bread if I don’t use eggs. 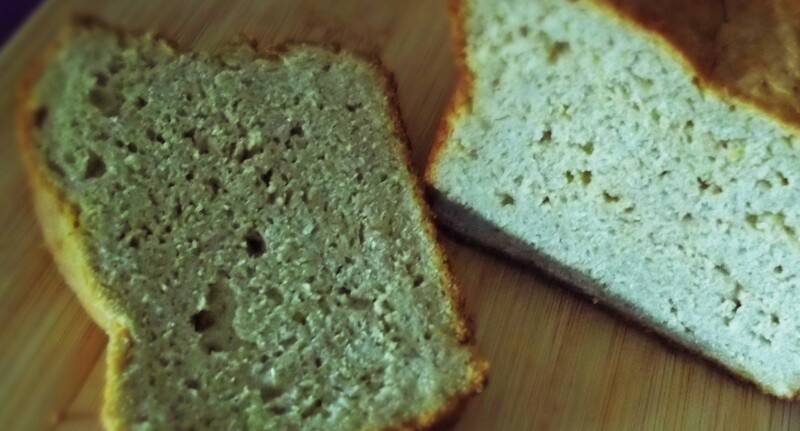 Yes, I know that flax seeds can be soaked and used as an egg substitute, but it still gives a very heavy texture to bread. So, I’m working on the egg replacement thing. This is a really tasty bread. 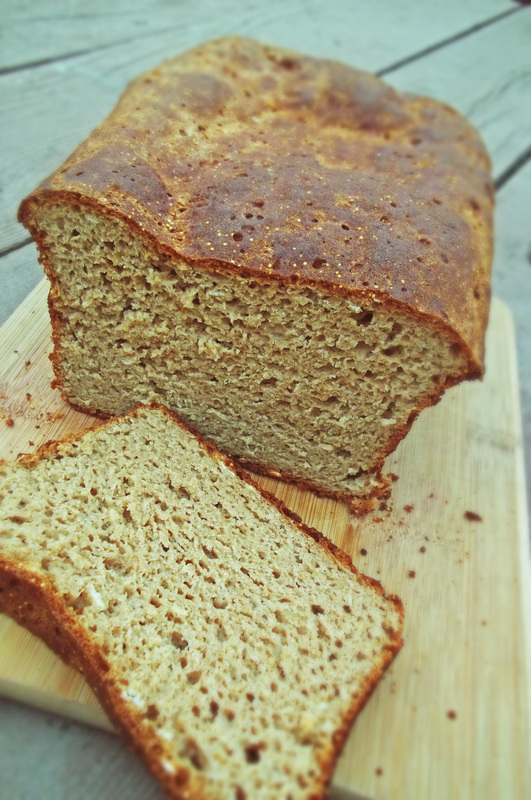 I love teff flour – it’s like a really nice wheat flour in terms of taste. The amaranth is a new grain to me, something else I’m experimenting with. It’s a high protein ‘grain’. I believe it’s actually a relative of spinach and chard. You don’t have to toast it to use it in the bread, but it has a nutty flavor if you do toast it. It’s easy to toast: you just put the amaranth in a deep saucepan and toast on medium high heat for 5-10 minutes, until the amaranth smells aromatic and starts to pop open. Just stir it around or shake the pan a bit so it doesn’t burn. This is now my new favorite bread. Give it a try. I hope you like it. Thoroughly grease a large loaf pan, making sure to grease the top lip of the pan as well. In a large mixing bowl, combine warm water, honey dry milk, salt, oil, vinegar, eggs, and yeast. Let the yeast proof for about 5 minutes, until bubbly. In a deep saucepan, toast the amaranth on medium high heat until fragrant, about 10 minutes. Shake the pan to move it so it won’t burn. Combine the amaranth and the remaining ingredients into a medium sized mixing bowl and mix well. Put the dry ingredients into the yeast mixture and mix thoroughly for about 3 minutes. The dough should be the texture of a loose cookie dough. Transfer mixture to a greased bread pan and smooth out with wet fingers. Baking hint: gluten free flours don’t spread the way wheat flour does, so whatever shape you want your loaf to be, make sure you shape it that way. Cover with greased plastic wrap and let rise until double, about one hour. While bread is rising, preheat oven to 375º. Bake in preheated oven for about 50 minutes. Let cool before slicing. I’ve heard somewhere that these were the figure skater Sonja Henie’s favorite cookies and that’s why they’re called ‘sonja henies,’ but I don’t know that for sure. I do know that they’re my family’s favorite cookies. These gluten free versions are just as good as the original version, but I like them even more than the original. They have that nutty flavor from the coconut flour and it contrasts nicely with the jelly filling. Enjoy! Cream together butter and sugar until light and fluffy. Beat in egg yolks and vanilla and continue beating until smooth. Beat in flour. Scrape dough into a large ziplock bag and flatten into ½ inch thick. Seal and refrigerate for about 1 hour. Preheat oven to 350º. Line cookie sheets with parchment paper. When chilled, scoop dough with a small scoop. Roll into a ball. Beat the egg whites with a little water. In a separate bowl, place the ground pecans. Dip each cookie into the egg white and roll in pecans. Place on cookie sheet about 1” apart. Using the end of a wooden spoon, make a little well in each cookie (about ½ of the depth of the cookie). Fill each dimple with jelly. Bake for 15-20 minutes until cookies are firm and slightly firm. Cool on racks. If jelly has boiled out of any cookies, heat up some jelly and refill the cookies. Well, here’s the paczki recipe. For those of you new to Polish delicacies, it’s pronounced ‘poonch – key’. These were a little difficult to make. The dough, once again, is delicated, and you have to be gentle when moving it around. Also, you have to be resigned to the fact that you will never again have a light and fluffly donut again. But, it’s a fun treat to try and make and they are tasty. You could substitute some other flours for the sorghum, like maybe white rice flour instead, and it will be a little lighter in texture, but I like these. The jelly filling with the sorghum flour is a nice treat. Enjoy! In a large glass measuring cup, heat the milk, butter, and sugar in microwave for about 45 seconds, until just a little warmer than room temperature. Add eggs, vanilla, salt, vinegar and yeast to milk mixture and let stand for about 5 minutes, until the yeast is puffy. In a large mixing bowl, combine the flours, tapioca starch and xanthan gum. Mix thoroughly. Slowly add in the milk mixture and mix for about 2 minutes, until all of the ingredients are fully combined. Cover with plastic wrap and let rise for about an hour. Punch down dough. Roll out to 1/4” thick. Cut with a biscuit cutter and place half of the donuts on a cookie sheet dusted with rice flour. With a little beaten egg, wet the edges of the donuts on the cookie sheet. 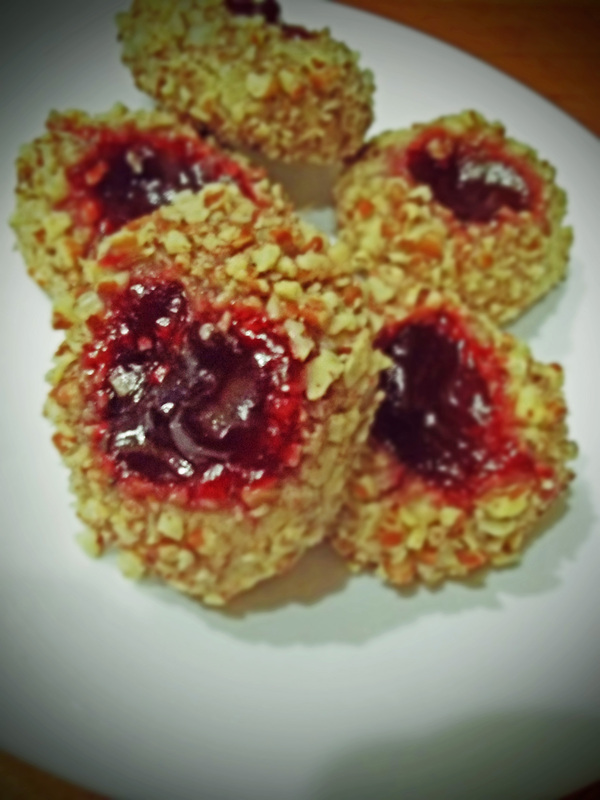 Top each with ½ tablespoon of jelly. Top each donut with another donut round and press together lightly. Let rise for another 30 minutes. Preheat oil to 350º. 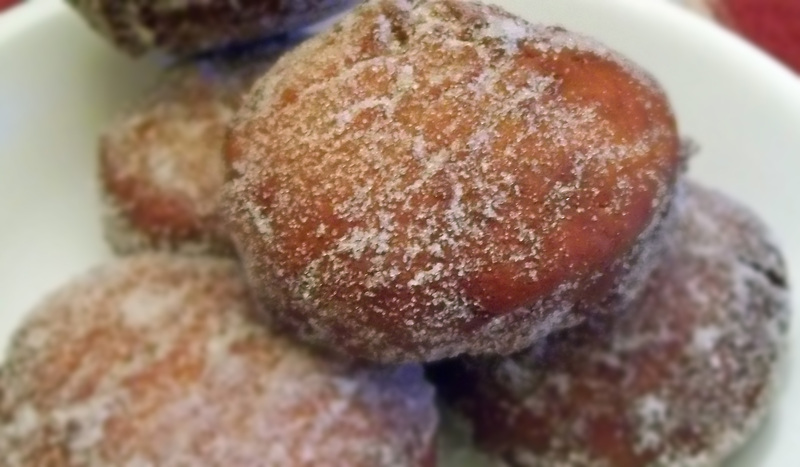 Fry Paczki for about 3 minutes, turning over about every minute, until golden brown. Drain on a cooling rack. Dip in sugar to coat. I used seedless raspberry jam for mine, but custard or any other filling of your choice will work, or you can leave them as is and just coat them with sugar. Makes 8-10 donuts, depending on how thin you roll them out. This is a once in a blue moon type of dinner. First of all, the Polish weren’t exactly known for eating light. Second of all, these are kind of labor intensive. The problem with gluten free dough is that it doesn’t stretch, which is really what you need to be able to do things that are stuffed. Another problem is that it doesn’t puff up in the same way that wheat flour does because it has a delicate structure. It’s like the difference between building a house out of mud versus building a house out of steel (the mud being gluten free flours, and the steel being flour with gluten). You can get a fluffy sort of texture with gluten free flour, but it is a delicate structure. Gone are the days of that crisp crack of the outer layer of bread with the stretchy, airy inside. But, hey, I’m getting over it. Sort of. So, we had a friend of ours over last night for dinner. He’s Italian and whenever he comes over, we make Italian food. Larry wanted to give him something different and make him a traditional Polish American dinner. 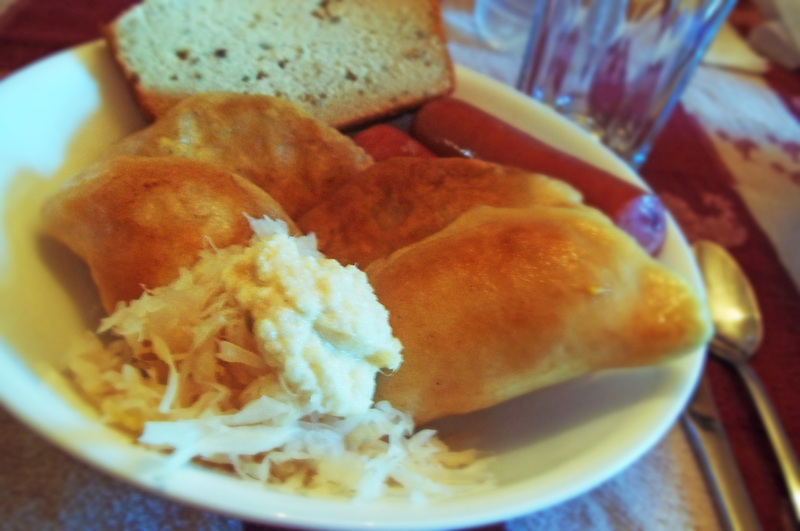 Our gluten free dinner was gluten free pierogies with a dairy free cheese filling, gluten free ‘rye’ bread (it had caraway seeds in it to mock the rye taste), some gluten free kielbasa and lots of sauerkraut and horseradish. Ugh. It was tasty, but it really is a stomach killer. We’re all moving a little slow today. Oh, yeah, and don’t forget the gluten free paczki for dessert (a Polish donut). I did make ‘regular’ food for the boys, but my daughter and I had the gluten free. If you’re up to a challenge, try the pierogies sometime. They’re a good substitute for regular pierogies, a little chewier than regular ones, but just as tasty. I used a brand of cheese called Daiya, but you can use whatever you want, even regular cheese. Daiya is expensive but worth it. It’s not something I buy very often, but good for a special occasion. The dough for the pierogies is very delicate, so be patient and use lots of dusting with rice flour. A bench scraper works well for moving the dough around. For cutting out the cirlces, I used a cup from Cumberland Farms (which is a convenient store in our area), but you can use anything that is 3″-4″ wide. The soup take out containers from our local Chinese restaurant is about the same width. I hope you give it a try sometime. Enjoy! For the filling: Do the filling first, so if you are boiling the potatoes, the filling will be cool when you fill the pierogies. In a bowl, mix all ingredients thoroughly. Using a 2 tablespoon scoop, scoop balls of the filling onto a cookie sheet and shape into football shapes. You want to make at least 24 scoops. For the dough: In a large mixing bowl, add the tapioca flour, white rice flour, potato starch, arrowroot starch, baking powder, xanthan gum, and salt. Mix thoroughly. In a 2 cup measuring cup, mix together the water, oil, vinegar, and eggs. Mix well. Slowly pour the liquid mixture into the flour mixture. Beat on medium for about 1-2 minutes, until thoroughly combined. Have a cup of water handy and a cup of rice flour for dusting. Split the dough into fourths. Wrap 3 of the balls of dough in plastic wrap. Dust a board well with rice flour and place one ball of dough on the board. Make sure your hands, rolling pin, and board are coated with rice flour. The dough will be very sticky at first. Roll out dough thin, to about 1/16” thickness. Cut into 4” circles. With wet fingers, wet the outside edge of the dough circle. Place a football shaped potato filling onto the dough circle and fold over. Pinch the edges closed. Place on a parchment lined cookie sheet, dusted with rice flour. Repeat with remaining dough. You should be able to get about 6 pierogies out of each quarter of dough. Cover prepared pierogies until ready to cook. When ready to cook, fill a large Dutch oven about half way full with water. Generously salt the water. Bring water to boil. Drop in the pierogies, one by one, cooking only a few at a time. Boil on medium high heat for a few minutes, until the pierogies float. Remove from water and drain well. At this point, the pierogies can be eaten, or you can pan sauté them in a little butter mixed with olive oil. Serve with sautéed onions. Makes about 2 dozen pierogies. Some people like chocolate chip cookies, some sugar cookies. 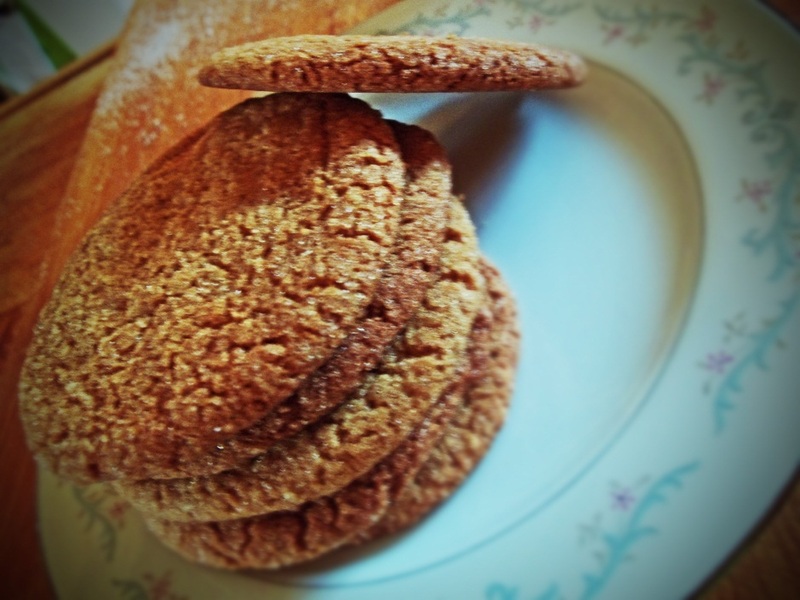 In my house, ginger snaps are the go-to cookie. It’s our traditional cookie that I make on Christmas tree decorating day. It’s the cookie that gets the most requests through the year. We like them soft, though, not crispy like the store-bought kind. If you like soft ginger cookies, these cookies are for you: just the right amount of spice, just the right amount of slight crispness on the outside. They’re just right. I use a vegan butter substitute instead of the butter, but don’t skip the shortening. The shortening gives them that nice chewy sort of texture without being dry and brittle. Enjoy! Preheat oven to 375º. Add butter and shortening to a mixing bowl and blend. Cream with brown sugar and beat until fluffy. Blend in molasses and egg until thoroughly mixed. Add remaining ingredients and mix well, until there are no lumps. Scoop with a 1” scoop and roll lightly into a ball. Dip in the sugar and place on ungreased cookie sheet. Gently slightly flatten the cookies. Bake in preheated oven, about 9 minutes, until golden brown and done (that’s when baking 2 trays of cookies at the same time – 8 minutes should be fine for baking just one tray). Cool 2 minutes and put on cooling rack to finish cooling. Really, I’m not a total bacon nut. Yes, it probably does make most things taste better, but, really, I don’t sprinkle bacon on everything we eat. My family, on the other hand, probably would if I would let them. 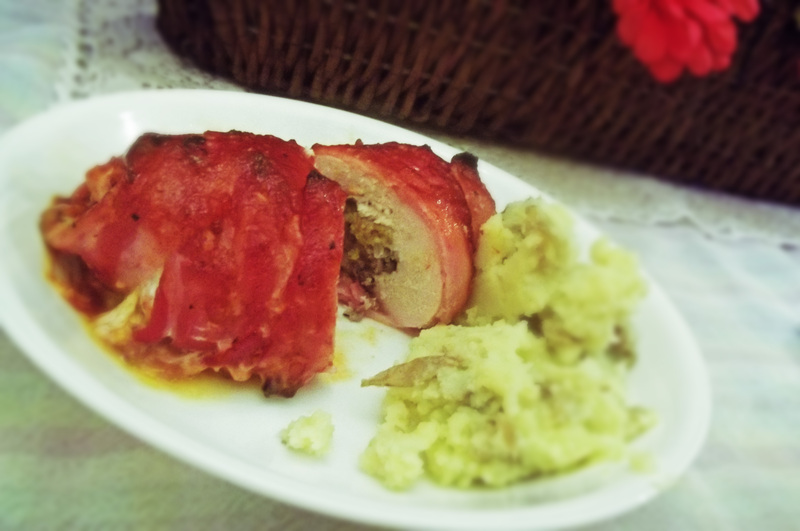 I guess there’s a show called United States of Bacon (or something like that) that my husband and kids were watching and they saw bacon wrapped chicken thighs and were kind of gaga over them, so here’s my stab at the recipe. Okay, so I only had boneless breasts, so I used those instead of chicken thighs, and I made up a stuffing that I use as my regular go-to stuffing for stuffed mushrooms. I found a gluten free brand of barbeque sauce, so I didn’t need to make my own: Dinosaur BBQ Sauce is gluten free (there are some others, but Dinosaur was the most affordable and the only name brand one there), and I used the honey garlic sauce because I thought it would compliment the sausage stuffing well. This turned out really good. It’s more like a Saturday night recipe, though, because it is a little time consuming. Wrapping the breasts in bacon isn’t the easiest thing to do and it takes a little patience. In terms of cooking, it really is an overall easy recipe. It just takes a little bit of time. I served them with smashed yukon gold potatoes and it was a nice mid-week meal. Hope you give it a try. Enjoy! In a large sauté pan, heat the olive oil and add the sausage. Break up sausage while cooking. When almost done, add the shallot and cook until translucent. Add in mushrooms and cook for about 5-10 minutes, until mushrooms are thoroughly cooked. Remove from heat. Add in the bread crumbs and chicken broth and stir to combine. To stuff the breasts: lay out each breast. Place about 1/3 cup of the stuffing over the breast. Top with 1 tablespoon of cheese. Roll up the breast and wrap with 3 pieces of bacon. Brush with barbeque sauce. Bake in oven for about 45 minutes. Baste again with barbeque sauce about half way through the cooking time. Turn the oven to broil and broil for about 3-5 minutes, until top is slightly caramelized. Let cool for about 5 minutes before serving. Makes 6 servings (very generous servings: we each only ate about ½ of a breast). Last weekend my daughter and I went to my sister’s house for a girls’ night sleep-over. Love girls’ night sleep-overs! The best thing about them (besides no boys allowed) is that we have dessert all to ourselves. Enjoy! For the Crust: Add all dry ingredients to food processor and mix thoroughly. Add butter or shortening and blend until mixture looks like crumbs. Add the egg whites and vinegar and mix thoroughly. Add mixture to a large zip top bag that has been sprayed with cooking spray on the inside. Flatten out and put in the refrigerator for one hour. 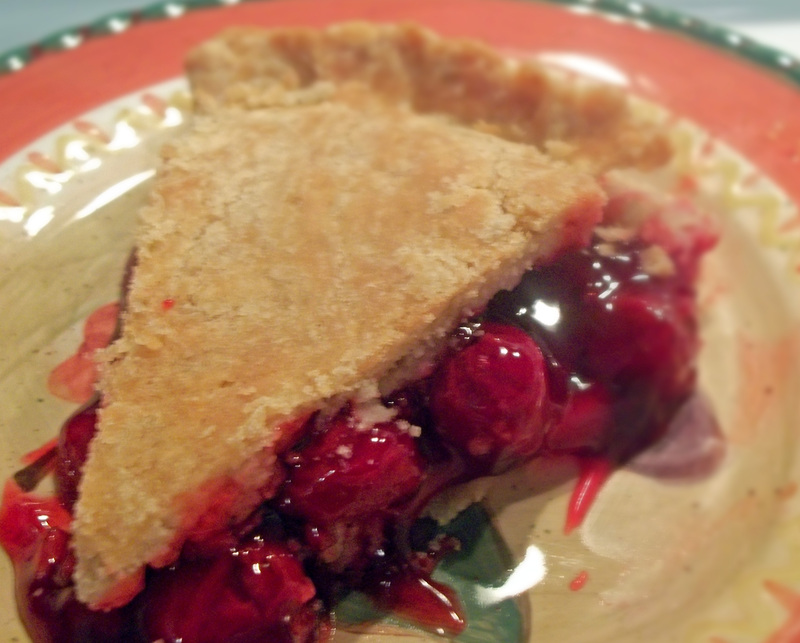 Repeat Recipe to make the top crust of the pie. Remove from refrigerator and roll out to fit a 9” pie pan. Cut open the bag and invert the crust over the pie pan. Press into pan and form edges. In a medium sized saucepan, cook 1 cup of the reserved cherry liquid with sugar, potato starch and a pinch of salt. Cook over medium low heat until thick. In a medium sized mixing bowl, add cherry liquid to the cherries and almond extract. Combine thoroughly and add mixture to prepared pie crust. Preheat oven to 375º. Top pie with second crust and crimp edges. Bake for 40-50 minutes on bottom shelf of oven until top is browned. Take the pie out of the oven and let rest at least 15-30 minutes before serving. We tend to have a different view of comfort food, for the most part. My family’s view of comfort food is something like chicken cordon bleu. When my son turned 9, our pastor asked him what his favorite food is (thinking that he would say ‘pizza’ or something like that) and my son said ‘chicken alfredo.’ But, we do like the occasional typical comfort food. 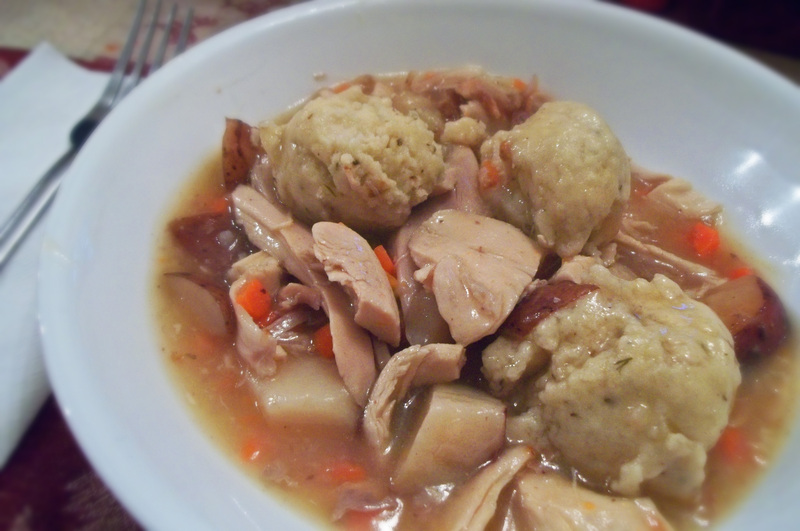 My family loves chicken and dumplings. They actually prefer the gluten free dumplings over the wheat dumplings. These are fluffy and flavorful. The texture is lovely with the stew. You can use these for any stew. I had some leftover roasted chicken and potatoes and I chopped it all up, added some chicken broth and thickened it and then I added thickener to it (you can use arrowroot flour or cornstarch mixed with a bit of water to make a slurry). This is an easy, mid weeknight meal. I hope your family enjoys this as much as mine. Enjoy! These dumplings can be used on top of any stew. I made a stew of leftover roasted chicken and vegetables. In a medium sized mixing bowl, combine the flours, xanthan gum, baking powder, basil, salt, and thyme. Mix well. In a separate small mixing bowl, combine the egg, soy milk, and the oil. Add wet ingredients to the dry ingredients and mix thoroughly. Bring your stew to a boil. Using a 2 tablespoon scoop, drop the dumpling mixture into the boiling stew. Cover immediately and turn the heat down to medium low. Cook for 20 minutes, until dumplings are cooked through. Makes 5 generous servings (3 dumplings each). Road Trip – what a better time for junk food. Well, technically, I don’t really consider white chocolate macadamia cookies ‘junk food,’ but it’s definitely something I don’t eat all of the time. Here was my stab at some gluten free cookies. 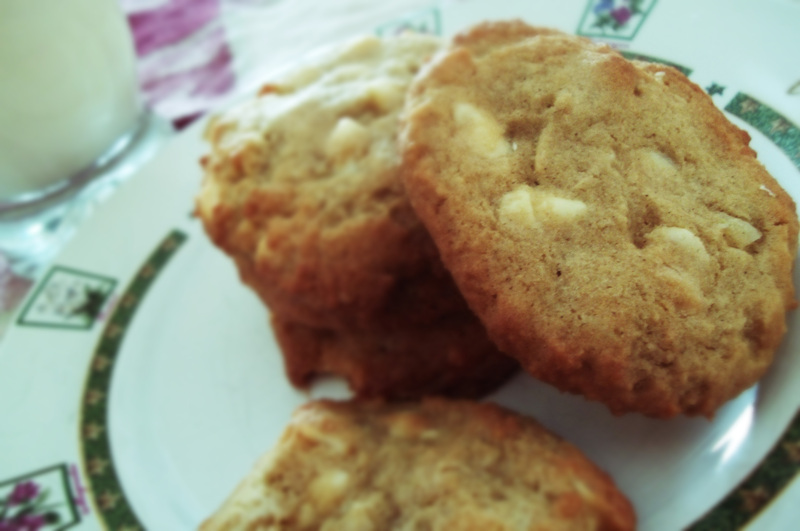 I had some macadamias and white chocolate chips I’ve been meaning to use, so I settled on these. 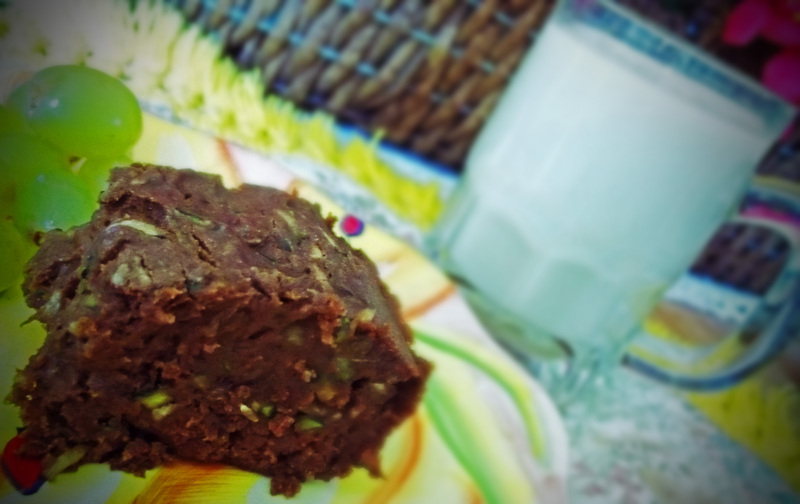 Of course, you can use the same recipe and just substitute chocolate chips for the white chocolate and skip the nuts or use some other nuts. Play with your food. This recipe turned out pretty good. They’re a little chewy, with a slight crispy texture on the outside. And the white chocolate / macadamia mix is a great combination. Perfect road food. Enjoy! In a large mixing bowl, cream together the butter, shortening and sugars until light and fluffy. Add the eggs, one at a time, and then the water and vanilla. In a separate mixing bowl, stir together the flours, xanthan gum, and baking powder. Slowly add to the butter mixture and mix thoroughly. Add in the white chocolate chips and macadamia nuts. Scoop onto ungreased baking sheets (I used a 2 tablespoon ice cream scoop). Slightly flatten the cookies. Bake in preheated oven for about 8-9 minutes, until bottom is golden brown. If baking 2 trays at the same time, switch the shelves half way through the baking time. Let cool for 2 minutes on baking sheets before removing to cooling racks. Makes about 4 dozen (or less if you eat a lot of the cookie dough).